Abandoned buildings being occupied, apartment complexes being renovated, and new clothing and dining options are now my realities living in Harlem, NY. These sound like positive alterations, but I am still unsure on how to feel about gentrification. It is difficult to measure how successful change is because there is often someone that suffers at the expense of changes in different environments. Scholars define gentrification as the buying and renovation of houses and stores in deteriorated urban neighborhoods by upper or middle-income families and small businesses. This is a very optimistic perspective with this definition, not indicating the many consequences of this process. Some consequences not discussed in this definition are how it affects education and the perception of those gentrifying the neighborhood by the individuals being kicked out. Each visit that I had made back home to Harlem, New York from New Milford, CT (where I attended the Canterbury school) from 2008 to 2012 I began to notice this gradual change. It started when I noticed a white person walking their dog one night. The moment was significant because of what it represented. Harlem had been a predominately African-American area for as long as I could remember; so seeing a white individual at night in my neighborhood was something that I recognized immediately because the person looked like a foreigner to the neighborhood. However, this was only the beginning of what was a rapid increase in the pace of the residential integration in the Harlem area. With the presence of more whites, different businesses began to enter the area such as Red Lobster, GAP, Joe’s Crab Shack, etc. With such change coming so quickly, I began to feel like an outsider in an area that I once called home. Many individuals in Harlem share the opinion of Timothy Williams, a Harlem resident, “While welcoming safer, cleaner streets, longtime residents have found themselves juggling conflicting emotions. And those who enjoyed a measure of stability in the old Harlem now long for the past—not necessarily because it was better but because it was what they knew”. It has been all that I know, so watching it become a shell of its former self is a tough thing to watch. I was observant to the change happening around me with new white neighbors, stores, etc. but the presence of white peers was non-existent during my early education. As a product of the Harlem Elementary School system, pre-gentrification, even though I never considered it, my school was segregated. I was under the impression that white individuals lived either in the suburbs or in downtown New York, two areas I had no reason to travel to. This segregation limited our perspectives because of the homogenous groups that made up the classroom. These elementary schools and later high Schools in the Harlem area remained mostly segregated, which resulted in low academic ceilings being set for me as well as my peers. We just did not have much exposure to non-minority dominated spaces. I saw the value in education, but I also recognized that having a limited point of view by only attending predominately Black schools would not prepare me for the real world. As a result, I attended private school to get that balance. I was able to expand my college options, while my peers had a very narrow set of options because of their lack of preparation and exposure. With my experiences as a result of my relocating, thoughts of how the educational paths of my peers in Harlem could have been different if they too had racial integration in their education swirled through my head. With so many things shifting as a result of gentrification, the impact of gentrification on education is a topic of conversation that is only beginning to be studied. I am interested to see how the influx of non-minority families is affecting the minority children within these Harlem elementary schools. Is the gentrification of Harlem changing the overall composition of the neighborhood schools? I wondered as to how that would affect children who are living through this significant change in the appearance of their peers. While a further, more extensive study can attempt to gain insight into individual student options, this study is going to examine the racial composition of Harlem zoned elementary schools from the 2007-08 school year through the 2012-2013 school year. This five-year period that saw accelerated white individuals moving into the Harlem neighborhoods. According to the U.S Census, the white population in East Harlem south was 55 percent greater than it was in the year 2000 (13,800). Also marked by a survey done in 2008, the white population as a whole had tripled in Harlem since 2000. Observing the increase in the rate of residential integration over the last couple of years, I also was speculative of whether or not this was translating to the classrooms of these previously segregated schools. One would want to see the residential mixing translate to more integrated classrooms so that there is consistency inside and outside schools. Scholars are extremely interested in the effects that residential segregation on the surrounding academic institutions. There are many pieces of literature that discuss the residential gentrification. Gary Orfield’s “Housing Segregation Produces Unequal Schools.” Sparked my interest because of the importance placed on housing being a determinant of school success. Orfield’s analysis focuses on suburban neighborhoods, and I was wondering how would those results vary if the area were not suburban. Given that Harlem is an inner city, but in the process of gentrifying, therefore resembling some of the qualities to that of a suburban area, would this produce academic success in Harlem? This is a driving point to my interest in this particular topic. I want to examine if the middle class individuals moving in because of gentrification are trying to move towards a collective community of elementary schools in Harlem or using it for their own benefit with no regard for whom they displace in the process. If Stillman’s theory were correct then creating the relationship between the middle and working classes in these neighborhoods (specifically Harlem) then Whites would not be portrayed as the selfish individuals that they appear to be. Although there is a significant amount of literature covering the topics of educational integration and gentrification, there is a lack of literature connecting the topics. Scholars have not been as critical into challenging middle-class families to integrate these inner-city schools. Their personal biases are guided towards the idea that being in the majority needs to be a requirement for their schools. White parents’ ideas of what Harlem elementary schools are eliminates schools before they are given a true chance. While I am not necessarily tackling Orfield’s theory of school success, I am making an attempt to see if significant integration is happening. With the numbers of white families quadrupling in a eight year period, I am anxious to see exactly how that has translating towards the education system. Literature Review: This review will examine gentrification residentially, and then discuss the possible consequences within education. Scholars are divided on the issue of residential gentrification because there are benefits and negative consequences to it, but it depends from what angle they decide to look at the issues from. Gentrification is described in Leslie Goffe’s “The Harlem Gentrification, “as a process which middle class people take up residence in a traditionally working class area of a city changing the character of the area”. The statistics provided by a 2010 New York Times article noted that in 2008 alone 22 percent of the white households had moved into their homes within the previous year, therefore making a convincing claim to Goffe’s definition. Further stats show that only 672 whites lived in central Harlem in 1990, according to census statistics. That number increased to 2200 by the year 2000, and by 2008, this number had doubled and quadrupled to 13, 800(Department of City Planning 2010). This number has continued to increase since then, which is why I desire to explore the possible effects of these within the classrooms in Harlem. The shortcomings of gentrification are mainly centered on the displacement and relocating of permanent figures (people or destinations) within the neighborhood. What sometimes is overlooked is the feelings of the people being gentrified. When an individual is fearful of their spot in the community, they are less motivated to help towards activities or projects in that area (Sheppard 2012). This view of being taken over is only one side of the story; for those individuals moving into the neighborhood gentrification is perceived as solely a benefit. An article published by the economist cited that the presence of professionals in one’s area as a positive because they “know how to get things done”. They put pressure on schools, the police, and the city to improve. As property prices increase, rents go up- but that also generates more property-tax revenue, helping to improve local services. (2015). These are indeed benefits, but this is coming from a privileged point of view. Property prices means increased rent for tenants that do not own the apartments they are staying in, so unless a raise in income occurs rapidly, then they will be evicted. The perception is that the whole community benefits from the changes that gentrification brings, but only a small percentage of the neighborhoods do. The same can be said for those going through school choice in a difficult New York City zoning system. School districts and zones dictate school choices for a lot of families, and they also limit the ability to integrate schools, but the alternative has its own risks associated with it as well. In New York (established in 1960s), there is a system of community school districts spread throughout the city that gives preference for students that live within the district over those applying to those outside the district. Scholars argue that the districts may have increased segregation, therefore forcing communities to be responsible for their own academic achievement. These districts also play a significant role in dictating the choices of the families entering this school system. School choice factors by race and social class because of the networks that people have available to them. Low-income parents are more likely rely on relatives about schooling options, which as a result gives them the perception of fewer options that are available to them. Their relatives’ information may not be that important in quality and it may be redundant. Another factor is the neighborhood around them. Property taxes account for a major source of revenue, and with segregation by race and social class has unfortunate consequences for schools. As a result of the lack of revenue driven from property, there is less money as a district’s disposal to use for school resources. (Goyette 2008). This tends towards segregation in elementary schools because of the residential segregation that comes as a result of the zoning process. These district lines have divided neighborhoods creating competition in extremely close quarters. Some argue that schools with lower achievement will see an increase of middle class parents brining resources with them. That is under the assumption that gentrifying group will stay with the schools in their district and choose attend school there. Some scholars also see zoning as a systematic way to exclude minorities from having more choices in regards to elementary schools. The problem with zoning is that the schools with the best reputations gain interest from more students than it can afford to admit. Students from outside and inside the zones may want to attend the same schools. Although there is preference to zoned school students, the students within the zone have no guarantee of entrance. The 2013 policy brief on school-to-school diversity noted that it is common for some zoned students to be denied admission or placed on a wait list for their zoned school. In 2013 alone, 2361 students were placed on waitlists for kindergarten at 105 overcrowded zoned schools. The national association of realtors estimated that 25% of homebuyers nationally listed school quality as a key factor in the selection of a home. Prospective parents are looking for the same qualities when looking at a possible school for their child, but these schools do not necessarily have enough seats for everyone. So if these new residents are not admitted into the “top-tier,” schools, then where are they going? Anywhere where they have the financial means to bypass the district system. The alternative of not participating in the zoning system is also a risky option because there are not as many options for un-zoned schools, and there is less of a probability of acceptance compared to that of a district school. Research suggests that a large number of parents would prefer to send their children to schools with more racially diverse schools if the option was there. This is an unpredictable method of trying to create racial integration in the classrooms because although there is equal opportunity for all, there is no guarantee of the racial composition of the students who will be admitted to these schools. However, there are some benefits if the compositions were to be representative of the overall population. Integrated the classrooms can make a significant impact on one’s personal and academic growth. Surrounding one’s self around like-minded people is not always a good thing because there are no disagreements among a homogenous group, which is the case with segregated institutions. Literature concluded that de-segregation has been positively correlated to increases in black student achievement levels. On average the gains are around .57 of a grade year at the kindergarten level and .3 of a grade year in student performance at the elementary school and secondary school level (Mahard & Crain 1983). Also, the information from the No child Left Behind Act (2002) showed that black and Hispanic students’ mathematics gain scores were greater in integrated schools than in segregated ones (Harris 2006 & Spencer et al 2009). No disagreements result in a lack of true discussions and the inability to think critically when having an argument in the classroom. Being able to reflection on one’s own ideas and experiences is beneficial towards one’s own personal expression as well as different audiences gaining a sense of perspective. This was lacking within segregated classrooms. The opportunity to share different experiences and possibly create friendships with people who did not look like me or were from different socio-economic backgrounds at such a young age would have altered my education. As I was mentioned earlier in my introduction, the exposure in High School to a more diverse environment really aided my academic growth. Studies have shown that show that diverse student bodies produce better academic results. Kahlenberg and Potter expressed in Smarter Charter that, “because separate schools for rich and poor are rarely equal, the explicit targeting of at-risk students in economically segregated schools weakens the potential of charters to promote social mobility”(47). Expanding beyond just charter schools, I believe this to be true for all schools. I think segregation essentially gives students of colors’ potentials a particular ceiling, when they should believe that they are limitless. Gary Orfield’s “Housing Segregation Produces Unequal Schools,” discusses the importance placed on housing integration and that being a determinant on school success. His study shows that the minority students benefit from the integration process in the classroom. The shared experiences of those individuals in different places on the economic spectrum allow students to learn more about themselves and communities outside of what they are familiar to. I wondered as to how that would affect children who are growing up in this period of significant change in Harlem. Orfield did state that the condition of the communities that the schools are attending play a significant role in the schools success. This will dictate funding and the resources available at particular schools. Harlem is such an interesting case because the process of gentrification is still not complete, and it is not within the suburban areas that Orfield examined. That leaves me uncertain of whether or not Orfield’s theory will be applicable to Harlem, NY. Looking to see if racial integration is going on throughout elementary schools in Harlem, then once that is done examining the possible implications of the integration or lack thereof. There is also a common misconception that only the students of color are benefitting from racially diverse classrooms and white students will regress, which is far from the case. The white students in a classroom learn just as much, if not more than the students of color as a result of integrated classrooms. Genevieve Sigel-Hawley of The National Coalition on School Diversity examined in her research brief that non-minority students have a better understanding of different points of view and a better sense of themselves as a result of being in a diverse setting. Sigel-Hawley also stated that the preparation for the real world that this type of environment gives most students is very significant. She also stated that U.S employers spend $200 to $300 million each year for diversity training because many individuals are ill prepared who come from different cultural, ethnic or socio economic backgrounds (Sigel- Hawley 2012). Imagine if that money were saved because people of all backgrounds had attended school with one another and knew how to interact with each other? That could be invested in areas like educational resources. Scholars have found the benefits of integration for both sides, so have parents began to understand the significance of at least some integration for their children? This lack of contact can also be reflected in the gentrified neighborhoods with the lack of inclusion establish by both parties involved. Speaking for Harlem, NY, the schooling process when I went through it was based on primarily who you knew and using one’s social capital to obtain spots in different schools. I am not entirely sure, which is why I will be examining this question in my study. The benefits of being in a gentrified school could be enormous, but there are some setbacks of an integrated school. For example Maia Cucchiara’s “Rebranding Urban Schools,” exhibited this sense of only having one main target audience for their rebranding of the school covered in the study Grant Elementary. It was specific to Philadelphia, but the concerns of the restructuring could apply to Harlem as well. Some of the parents in the study were recruited and sought out by individuals from similar economic backgrounds to attend this prestigious elementary school. When applying for the school, race played a significant role in the attitudes of the administration when interacting with a perspective parent for the school. The school appeared to give a warmer reception to those from the middle-class backgrounds than those attempting to transfer from a school in a lower economic area. Critical scholars argue that if it is not controlled, then these integrated schools can lean towards catering mostly to the upper middle class parents and their kids desires, while just bringing other groups along for the ride. Family concerns would vary significantly within these schools in Harlem if they were to be integrated. Working class parents may be concerned with transportation and meal expenses for their children, while upper middle class parents have other desires for their children. Integration works as long as there is an all-around effort towards forging this new community. Positive integration among the new residents and current residents would be a top priority. In Jennifer Burns Stillman’s Gentrification and Schools: The Process of Integration When Whites Reverse Flight (2012), she states that the absence of a relationship between the middle or upper class individuals (mostly white) and minorities creates more of an opportunity for the new white residents to be portrayed as selfish people infiltrating areas in which they are now the minority. Stillman does not note the shift towards catering to the non-minority students’ concerns when integration does occur within the schools as well as the neighborhoods. There is a silencing of the lower-income voice because of the perceived lack of influence that they have in the neighborhood and in the classroom. This creates the tension between the two groups that breaks the entire community down. This shift can also contribute towards a sort of dependency upon these middle-class families to come in with their resources and change things. The parents’ volunteer and collaboration efforts should be a substitute for structural changes; it should be complimentary with parent efforts (Posey-Maddox 2014) Ensuring that all of the students’ concerns are met and not just the middle or upper class individuals is a step avoiding the selfish labels of the new residents of Harlem. However, the parents of the students play as much of a role as the students in creating this strong collective that Stillman wants to see. Despite all the changes Stillman would wish to create, one still has to be skeptical on ones motives. Makris and Posey Maddox both noted that, the choices and engagement of even the well-intentioned parents can contribute to inequality because of their positions within broader systems of advantage and disadvantage. (Posey-Maddox 2014 & Makris 2015) To have the process of school integration begin, people must refrain from feeding into their individual bias. Richard Kahlenberg (2001a, 62): “Educated middle-class parents are more likely to be involved in their children’s schools to insist on high standards to rid the school of bad teachers, and to ensure adequate resources (both public and private) – in effect to promote effective schools,” (Posey Maddox 2014) why is diversity and inclusion not valued by parents when choosing schools then? “Don’t know how you would expect anything close to a 50/50 ratio anywhere in Harlem when the 2010 census shows that the white population is less than 20% in most census tracts.I might have missed something but I didn’t notice any areas with more than 26 or 28 %. Even if all the white people sent all their kids to public schools you would never have anywhere near 50/50. My data was gathered from the National Center for Education Statistics. 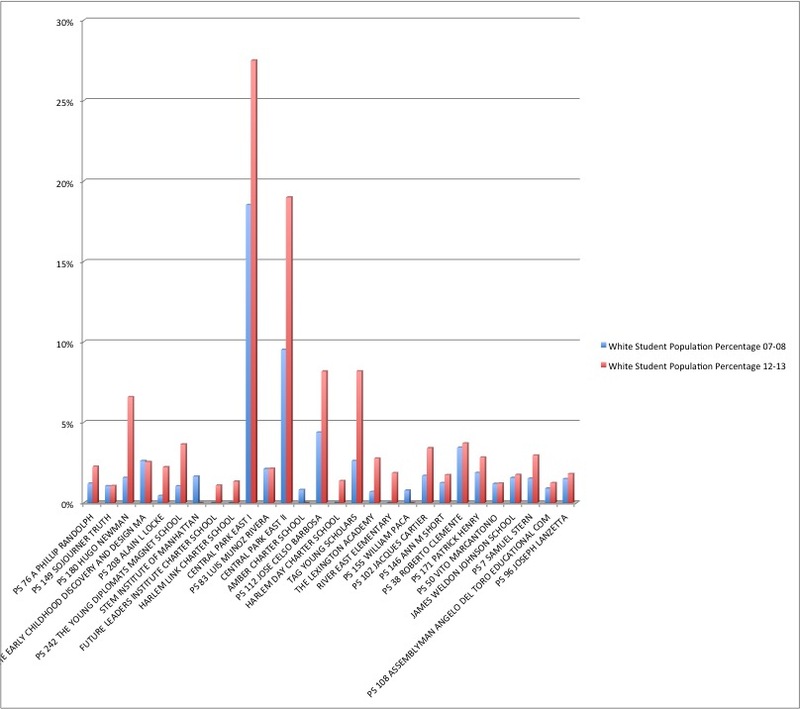 I created a sample of the racial demographics of 28 schools during the 2007-08 and 2012-13 school years respectively. These years are being observed because it was a period in which the residential integration within Harlem began to increase significantly; in other words, the gentrification process was happening much more rapidly than in the past. The schools that are being observed upon are those that are within the boundaries that encompass the Harlem area between 110th street and 155th street on the west side, and between East 96th street and 142nd Street on the East side. Using the information, I was able to calculate the five-year difference in percentage for the White students in these Harlem elementary schools. increase), and P.S 112 Jose Celso Barbosa (4% increase). The rest of the schools examined in the study showed no greater increase than 3% (PS 242 The Young Diplomats Magnet School). Of the 28 schools observed, approximately 9 of the schools displayed no increase, 3 schools showed a negative difference, 6 displayed a 1% gain, 4 with 2%, and 1 with a 3% change in the white students populations over the five year period. That means that approximately 79% of the schools examined in this study showed at most a two percent change in white students. Of the five schools, P.S. 180 Hugo Newman was the only school that was zoned. All of these schools did have progressive curriculums such as a dual language program, community mentor programs, etc. The rest of the schools that experienced the greatest increase were the ones that took in students from all boroughs and districts through a lottery. There is no guarantee that the students being provided this education are students from Harlem. This proved to be significant because the insider schools search engine (a reputable source used for perspective parents) that I used to find these particular schools, already marketed certain schools. These schools were already successful schools recognized by the city. The schools were judged on the criteria of whether or not four categories (discipline, attendance, reading scores, math scores) were better than, near, or worse than the citywide average. Some schools were distinguished as “an Insider Schools Pick,” which was defined by the website as “Schools that, In the opinion of our staff, serve their communities well. All strive to create an atmosphere in which staff, children and parents work together productively”. This was significant to me because I felt like this was a recruiting tool for attracting non-minority students to these schools. Here is a reliable, reputable source deeming certain schools worthy or not worthy of this recognition. The schools that did not receive the positive ratings are essentially off the radar regardless of whether or not they are within the zone. After examining the greatest increases among these five schools, I decided to observe the composition of white students by grade to see if gentrification coincided with the presence of younger families. *Note PS 112 is a Pre Kindergarten through 2nd grade program. Graph 2 shows a grade-by-grade composition of the percentage number of white students for each of the five distinguished schools from graph 1. Those schools were recognized because among the 28 schools in this study, these were the only five schools to experience a growth of five percent in their white student population. A common trend throughout the schools is that the earlier grades of Kindergarten through 2nd grade account for near, if not more than half of the white student populations for the schools in this graph. The younger grades support that this rapid pace of residential integration is happening, so families are sending their kids to these reputable elementary schools. This gives evidence of the recent trends of gentrification with more white families moving into the area and attending these schools. This suggests that these numbers will change more over time adding to the current white populations within these schools. These schools will change, but what about the other schools? These are recognized as some of the top elementary schools in the city, and we know that the seats are limited within these institutions. The seats in these schools will become more and more integrated, and making the process of trying to attend these schools more and more difficult. Also, white students from other, less integrated schools may attempt to leave their school and attend one of these more reputable institutions. This could just create the separation among Harlem elementary schools that many are aiming to change. My literature review exhibited the benefits and costs of residential integration, and how those choices play a crucial role in the structure of one’s education. Residential gentrification displacing people, but also brining people that people cannot ignore because of the resources they possess. The people with the resources have the choice of whether or not to share their positioning with others in the community; they can come as new residents and work towards a cohesive community or be out for simply their self-interests. This translates to the schools because segregation in Harlem can limit minority students’ chances of something beyond the city, but depending on the presence of middle-class people to fix what is wrong is also problematic. For integration to even work, white individuals who are the majority of gentrifiers coming into Harlem need to address their individual biases when aiming to both help the community, but do what is best for their children. Parents make the decisions on where a family will reside and where they will go to school. White individuals need to be willing be uncomfortable in the academic setting for this process of integration to work. Residential gentrification and racial integration in the classroom are connected because parents are at the forefront of this process (Makris 2015). My own findings showed that gentrification is having an impact on the elementary schools in Harlem. The younger grades of the five schools (Central Park East I, Central Park East II, TAG Young Scholars, PS 180 Hugo Newman, and P.S 112 Jose Celso Barbosa) that experienced the greatest five-year growth showed that the white students were recent additions to the school, marking the presence of new families. It is difficult to determine the significance of that impact because only five of the 28 schools observed in this study experienced more than a 4% increase in total white student populations. Also, these five schools had a great reputation throughout New York City, so they were already distinguished schools prior to this study. I desired for a significant increase for those schools that were not so much in the public eye because it would have shown an effort on the parts of these middle class families that they were going to school in their new neighborhood. The limitations of my research centered on time and school regulations. The study was based on observational data, which does not give me much context for different variables outside of gentrification that could have played a role in the results. Also, for this particular study, it is difficult to determine just how much residential gentrification and school integration should be deemed responsible for the success or failure of the schools. Also, I would have wanted to do more of an ethnographic study by actually spending a period at each of the schools to get individual students’ perspectives on the change in the racial composition of their peers. Do they see it as the norm because they have no pasts of a segregated school to look back on? Although the district does give preference to the students that life in the districts provided, then is no guarantee that all the students were Harlem residents. The data that I will not be able to obtain for this study is the specific addresses of the students that are attending the examined elementary schools. These institutions will not give out such information, on account of confidentiality. Without this information, many will question whether or not the student populations are representative of students that live in Harlem. Students living within a school’s zone have admission priority over students who live outside the zone, but are not obligated to attend that school. Also, according to a policy brief done on New York City district elementary schools, it was determined that, “ for the city’s most popular or overcrowded schools it is common every year for some zoned students to be denied admission and placed on a waitlist for their zone school. It is something to be acknowledged, but not something that can be truly accounted for (2004). The gentrified people have much reason to have a positive outlook on gentrification. With the increased cost of living in these areas, there is a level of uncertainty that comes with the presence of new neighbors. Who knows if gentrified residents will be able to take advantage of the benefits of the exciting new businesses that have relocated in their neighborhood? Slowly there becomes this realization that they (lower income minorities) are not the intended audience for these new businesses. I think the same can be said for the schools that have altered their infrastructure within the last couple of years. Where was this initiative towards education in Harlem before gentrification began to take shape? There is all of a sudden this sense of urgency to turn the same schooling system around that not many paid much attention to in the past. Is this a consequence of racial integration in the classroom? There has to be evidence of that existing in the first place to find out. It is hard to really see that in Harlem outside of the five schools I examined. Knowing that gentrification is happening around Harlem and residences are being integrated, we should be asking more from the parents to do the same for the schools in the area. There are advantages and disadvantages to integrated schools, but If the families entering a new neighborhood want to fully immerse themselves into the community, then sending their children to local elementary schools would be convenient for them and showing an effort towards forging a new community. Tensions are running extremely high right now with all of the social issues between Black and white individuals. I think that the root of a lot these issues is a true lack of understanding from both sides. Each side does not know each other because they have little to no interaction with one another. The value of shared experiences cannot be underestimated because that would be a step in the right direction towards understanding one another. I feel like the elementary school students were the perfect-targeted group because they are the future. There are risks of inner city integration that have been discussed in great length throughout this piece, but its benefits cannot be overlooked. This can be a step towards developing socially conscious Black and white people that can promote peace throughout this society filled with so much anger and hate. Elementary school students are at a critical stage in the development of their ideals and sense of direction. Improving the image of inner city schools all starts with one family that steps out from the status quo and takes a chance to make some significant change. Center for Immigrant Families. 2003 “Segregated and Unequal: The Public Elementary Schools of District 3 in New York City”. Cucchiara, Maia. 2008. “Rebranding Urban Schools: Urban Revitalization, Social Status, and Marketing Public Schools to the Upper Middle Class.” Journal of Education Policy 23 (2): 165-79. Goffe, Leslie. 2014. “The Harlem Gentrification: From Black to White.” New African Magazine, June 25, 2014. Goyette, Kimberly. 2008. “Race, Social Background, and School Choice Options 1.” Equity & Excellence in Education 41(1):114-29. Harris, Douglas N. “Lost Learning, Forgotten Promises: A National Analysis of School Racial Segregation, Student Achievement, and “Controlled Choice” Plans. Center for American Progress, 2006: 14. Kahlenberg, Richard and Halley Potter. 2014. A Smarter Charter: Finding What Works for Charter Schools and Public Education. New York: Teachers College Press. Lewis, Amanda E. 2003. Race in the schoolyard: Negotiating the Color Line in Classrooms and Communities. New Brunswick, NJ: Rutgers University Press. Makris, Molly. 2015. Public Housing and School Choice in a Gentrified City: Youth Experiences of Uneven Opportunity. New York: Palgrave Macmillan. New York Appleseed. 2013. “Segregation in NYC District Elementary Schools and What We Can do about it: School to School Diversity”. No Child Left Behind Act of 2001.Public Law No. 107-110, January 8, 2002. The Opinion Pages. 2012. School Integration: “Revisit a good idea”. New York Times, May 27, 2012. Orfield, Gary. 2013. “Housing Segregation Produces Unequal schools: Causes and Solutions. Pp. 40-60 in Closing the Opportunity Gap: What America Must Do to Give Every Child an Even Chance, edited by P.L. Carter and K.G. Welner. New York:Oxford University Press. Posey Maddox, Linn. 2014. When Middle-Class Parents Choose Urban Schools: Class, Race, and the Challenge of Equity in Public Education. Chicago, IL/ United States: University of Chicago Press. Desegregated Schools,” in The Consequences of School Desegregation, eds. Christine H. Rossell & Willis D. Hawley. Philadelphia, PA: Temple University Press, 1983: 103, 107,111, 113. Schneider, M., Teske, P., Roch, C., & Marschall, M. (1997). “Networks to nowhere: Segregation and stratification in networks of information about schools.”American Journal of Political Science, 41(4), 1201–1223. Sigel-Hawley, Genevieve. 2012. Research Brief: How Non-Minority Students Also Benefit from Racially Diverse Schools. The National Coalition on School Diversity. Washington, D.C: The National Coalition on School Diversity. Retrieved March 6, 2015 (http://www.school-diversity.org/pdf/DiversityResearchBriefNo8.pdf). Spencer, et al. 2009. The Benefits of Racial and Economic Integration In Our Education System: Why This Matters for our Democracy. The Ohio State University Kirwan Institute for the study of Race and Ethnicity. Columbus, Ohio. Retrieved March 6, 2015. (http://www.racialequitytools.org/resourcefiles/spencer.pdf). Stillman, Jennifer. 2012. Gentrification and Schools: The process of Integration when whites reverse flight. New York, NY/ United States: Palgrave Macmillan. The Economist. 2015. “Bring on the Hipsters: Gentrification is good for the poor.” The Economist, February 21, 2015. Williams, Timothy. 2008. “Mixed Feelings as Change Overtakes 125th St.” New York Times, June 13.